Showtime's new series Nurse Jackie begins Monday, June 8. Partnered with the premiere of the new season of Weeds, Nurse Jackie follows in that series' footsteps of completely discarding all the usual conventions of female characters on TV. Whether this is a good thing remains to be seen. Jackie (the always intriguing Edie Falco) is not your typical angel in white. She's more like a seriously flawed Robin Hood of the hospital, making morally questionable choices for what she feels is the greater good. She forges patient signatures on organ donor cards, and steals from a violent criminal to give to a pregnant widow. On breaks she grabs a quickie from the hospital pharmacist and then snorts the contents of the painkiller capsules he sneaks her for her bad back. The other doctors and nurses on staff live largely in a state of jaded pragmatism. Nothing surprises or moves them particularly, numbed as they are by the beaurocracy of the hospital system, the horrors of what they've seen, and the darkness of human nature and behavior. As with most series, the premiere of Nurse Jackie is perhaps too obviously quirky, running through each member of the cast and trying to summarize them with a few quips, tics, or quotable ponderings. As it settles into its normal routine, I hope Nurse Jackie will hit its stride and seem a bit less affected. The biggest oddity of the pilot episode was Dr. Fitch Cooper, played by Twilight's Peter Facinelli. Cooper is entitled and arrogant and seemingly incompetent, and apparently reacts to nervous situations with inappropriate sexual touching. As Nurse Jackie confronts him over the death of a patient, he grabs her breast. I realize sometimes life is crazy and people don't always fit the neat, fresh stereotypes on TV dramas, but this quirk seems a bit over the top. Weeds does all sorts of inappropriate and insane things, but Weeds is much more obviously a comedy. Nurse Jackie is being billed as a comedy, but it skirts some serious life and death issues that seem awkwardly undermined by the stabs at humor. Darkly funny dramas can certainly work and be entertaining, but Nurse Jackie doesn't quite seem to have the balance right yet. Watch Nurse Jackie on Showtime, Monday nights at 10:30/9:30c. Watch the first episode online for free at the official Nurse Jackie Showtime website. 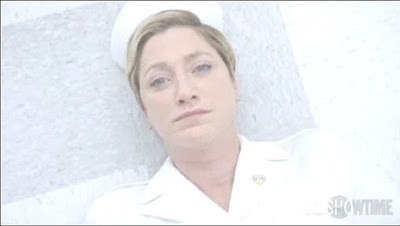 PHOTO: Edie Falco as Nurse Jackie, Pilot episode of Nurse Jackie, screencap c2009 CBS Paramount, Showtime. I actually never watched the Sopranos. I caught a few minutes of it here and there, and just never got into it. I'm not big into mob story stuff, but I do think Edie's always been a great actress. She's the only reason I considered tuning in to the series, and the main reason I'll try it again.